The Manufacture Vulcain pays tribute to France in a 50-pieces limited edition of its famous alarm timepiece, the 50s Presidents’ Watch. A fine way of celebrating the long-established ties between the Swiss brand and the land of luxury, elegance and refinement. France has always held a special place in Vulcain’s history since it was founded in 1858. Creations by the Manufacture soon achieved impressive success on this market. In 1889, at the World’s Fair held in Paris at the foot of the recently erected Eiffel Tower, Vulcain attracted attention with its rich range of simple or complicated pocket-watches. These included the “La Vallée de l’Arve” Grande Complication model with grand strike, minute repeater, perpetual calendar and moon phases that won a bronze medal. France also played a key role in the birth of the Cricket calibre that earned Vulcain international fame. In 1943, at a time when Vulcain’s Managing Director Robert Dittisheim was seeking to develop the first genuinely functional wristwatch capable of awakening even the deepest sleeper, French physicist Paul Langevin paid him a visit in La Chaux-de-Fonds. During a stroll through the garden, the latter assured him that of a tiny creature like the cricket could make a sound that was audible from a distance of 30 metres, a small case housing a complex mechanism must be able to match such a performance. Buoyed by this scientific support, Robert Dittisheim pursued his research that was to lead in 1947 to the launch of the calibre with twin calibres (one for the movement and the other for the alarm) named the Cricket as a nod to the insect’s strident song. The Cricket watch appealed to many prominent statesmen, including Truman, Eisenhower, Nixon and Johnson – a fact that earned it the famous moniker as “The watch of Presidents” or “The Presidents’ Watch”. It was also a great success in France, even starring on the wrist of Eddie Constantine in Votre dévoué Blake, a film directed by Jean Laviron and released in 1954. 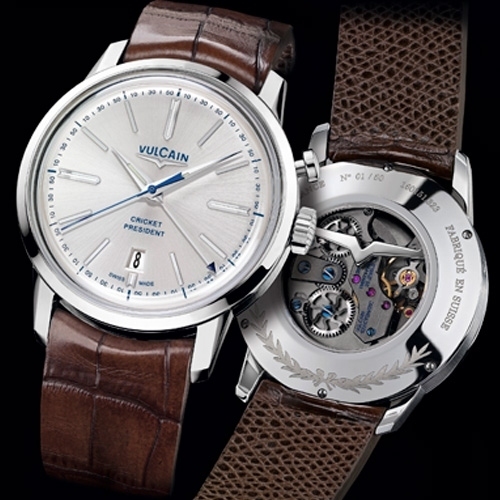 Since Vulcain’s return to the forefront of the watchmaking scene, the French market has always been among the leading followers of the brand and of its new models. French retailers have also proven extremely active in supporting this renewal, and the Manufacture is keenly aware of the daily significance of their backing. In homage to France and to the enthusiasm for the brand shown by French customers, Vulcain is innovating by introducing its first ever watch specifically dedicated to a nation. This 50-piece limited edition of the iconic 50s Presidents’ Watch features a 42 mm steel case housing the legendary mechanical manually-wound Cricket V-16 alarm movement equipped with the brand-patented Exactomatic system ensuring improved rating regularity on the wrist. Particular care has been lavished on the polished and satin-brushed finish of the case that lends a chic and vintage touch. The sunburst silver-toned dial with applied hour-markers is distinguished by its aura of elegant understatement expressed through hours, minutes and seconds hands along with a date window at 6 o’clock. Finally, the owner of this limited-edition timepiece can precisely adjust the alarm time thanks to a central hand tipped with a black arrow gliding across the graduated scale around the outer rim of the dial. The case-back is engraved with the name of the watch, the individual series number as well as a crown of laurels – a symbol of strength, of victory and accomplishment – as well as of peace, knowledge and creativity. One also notes the choice of the colour blue for the Vulcain logo, the sweep seconds hand and the alarm markings. The sapphire crystal window provides an admirable view of the refined movement finishing (Côtes de Genève, anthracite treatment, blued screws and openworked ratchet-wheel), topped by the V for Vulcain. Each of the watches in this special edition comes with its individual certificate. Paying tribute to French expertise, tradition and excellence, the Manufacture Vulcain has chosen to associate with the famous ABP company located in Paris on the Marché-Saint-Honoré. “Leather artisan, time machine, zoo or travel agency”: the Atelier du Bracelet Parisien (ABP) is all of that rolled into one. Above all, it is a firm dedicated to hand craftsmanship. All the straps and other products are entirely made in the Parisian workshop. Enthusiasts can choose from a vast array of hides, colours, shapes, tanning processes and thicknesses. Each strap is thus entirely hand-crafted according to the most stringent quality criteria.